Self locking boxes/trays, these are stackable when loaded with product, generally used for packing tins, jars or bottles, you will often see these trays in supermarkets printed with product details or brand image. 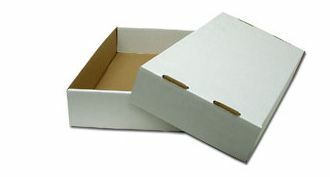 The trays can be manufactured in different options to suit your budget. Brown on the inside and out is most common and most cost effective but we can also offer mottled outer liner or white on inside and out. We also have the option of printing the tray up to 2 colours to increase brand awareness and make the tray more eye catching. 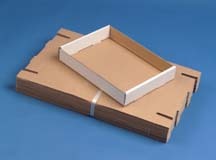 The trays are supplied flat packed, they are very easy to assemble. Trays can be bundled into manageable quantities if this suits your storage. If you would like to discuss a requirement for self locking trays or a self locking box&lid then click here for our quotation page, fill in a few details and we will call you back. If you want to give us a call then our number is 0161 872 7745, we would be happy to hear from you. 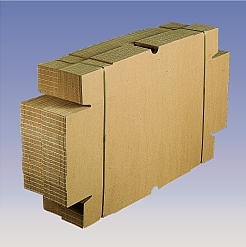 Can also be used as a quick assemble telescopic box and lid.